Ferengi Characters, Star Trek: DS9, "Little Green Men" Episode Screen Shot, January 16, 2011. Image qualifies as fair use under United States copyright law because of its low quality and limited use nature. 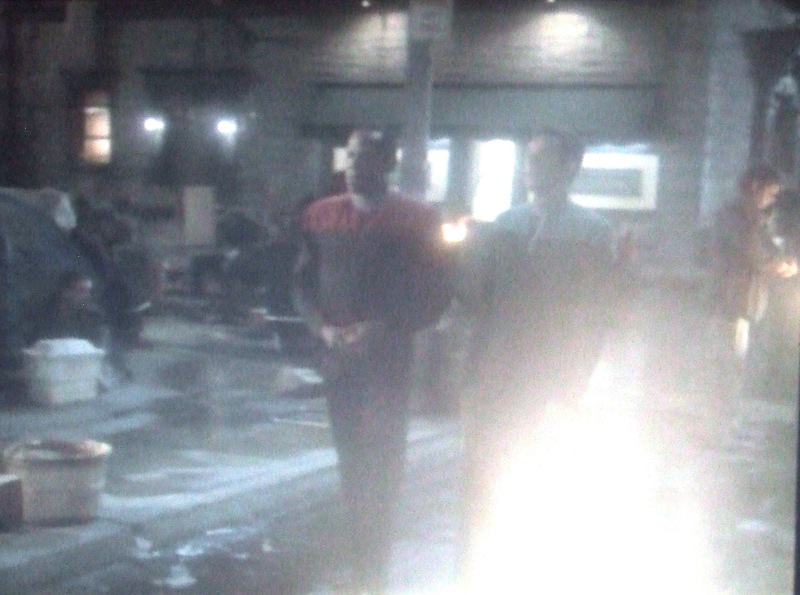 Maquis Characters, Star Trek: Voyager, "Caretaker, Part I" Episode Screen Shot, January 16, 2011. Image qualifies as fair use under United States copyright law because of its low quality and limited use nature. In honor of Martin Luther King Day ’11, it’s my privilege to discuss Star Trek and stereotypes. For whatever reason, I’ve spent the better part of the past six months watching episodes of different Star Trek series in my spare entertainment time. Whether the theatrically great DS9 (Deep Space 9), the ever-goofy TNG (Next Generation), or the uneven and mediocre Voyager, the Star Trek franchise that made runs of four different series between ’87 and ’05 had at least one theme consistent with our much less harmonious twentieth and twenty-first century times. Playing to stereotypes seemed to be a common undercurrent, though with great makeup artists — and at least with DS9, good writing and acting — those stereotypes were light and subtle. In watching, it amazed me that nearly all actors who played the alien Ferengi were Jewish. Yes, the actors who played the Ferengi characters were supposed to be short, but I didn’t know that Jews had cornered the acting market for people under five and a half feet tall. 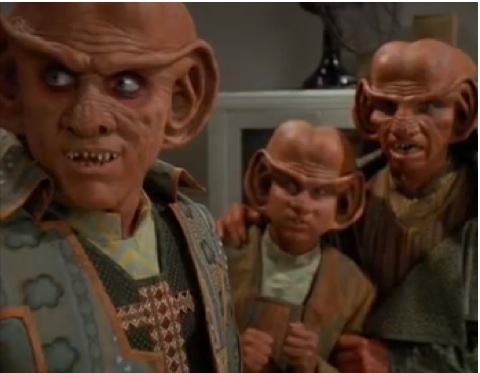 Armin Shimerman, Aron Eisenberg, Wallace Shawn, and Max Grodenchik all played the main Ferengi characters on DS9. Not so ironically, the Ferengi culture centered itself on making profit by virtually any means necessary, a pretty vile stereotype for an entertainment franchise based on a future and better human race. Even while watching DS9 in the late-90s, when all of the episodes were new ones, I commented to my friends that NBA Hall-of-Famer Reggie Miller could easily play a Ferengi, even at six-foot-seven, because the makeup artists would have very little work to do. Of course, that wasn’t to be. 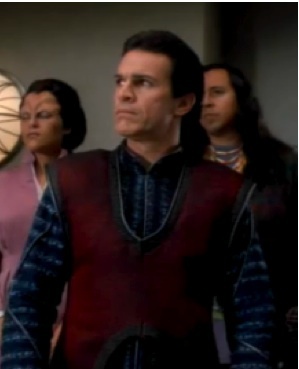 Tony Plana as Maquis Character, Star Trek: DS9, "The Maquis" Episode Screen Shot, January 16, 2011. Image qualifies as fair use under United States copyright law because of its low quality. It wasn’t just the Jews-as-Ferengi that I picked up on the first or second time around. 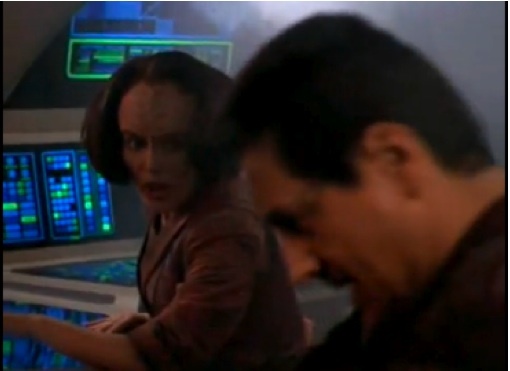 On both Voyager and DS9, the Maquis, a guerilla group fighting for disputed territories, had a disproportionate number of Latino actors playing those lead characters. Robert Beltran, Roxann Dawson and Tony Plana (mostly known these days as the father on the recently ended TV series Ugly Betty) were among the Latino actors playing these characters. I guess that the passionate or hot-blooded Latino stereotype played a role in the selection of these quality actors to play passionate or hot-blooded rebels in the relatively placid paradise of the Star Trek galaxy. Anthony Montgomery as Travis Mayweather, Star Trek: Enterprise, January 16, 2011. This screen shot qualifies as fair use under US Copyright laws because it is of low resolution screen shot and is a minimal use. 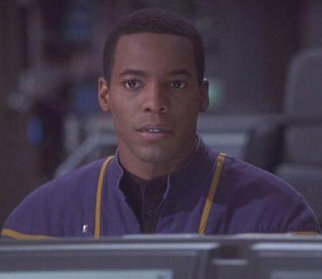 as the blind engineer to Michael Dorn as the semi-defanged Klingon, and from Tim Russ as the more-emotionally-repressed-than-normal Vulcan to the milquetoast twenty-second century human played by Anthony Montgomery, these characters seldom were provided the opportunity of a higher level of complexity beyond stereotypes or in playing an anti-stereotype. The one notable exception was Avery Brooks’ character Capt. Benjamin Sisko, who became one of the Bajoran Prophets at the end of the DS9 series, destined not to enjoy the fruits of his god-like work in the here-and-now. I’m not bringing all of this up to denigrate the Star Trek franchise. I actually love DS9, still like TNG, and can tolerate an occasional Voyager episode. Rather, this is about the battle over racial stereotypes, living them down, defying them, and being surprised when others don’t exhibit them. The fact that a franchise as optimistic and progressive as Star Trek couldn’t avoid major stereotypes says a lot about how deeply ingrained they are in our advanced culture. Here’s a stereotype-breaking thought. Let’s make most of our images of alien humanoids out there somewhere in the Milky Way into folks who have various shades of brown skin. I know that this wouldn’t play well on any future Star Trek series. But this has about as much of a chance being true as the pink-skinned humanoids that characters in the Star Trek franchise constantly encounter. This first-contact stereotype, of course, is the hardest one of all for the Hollywood set to break. It still amazes me that people are amazed that someone like me, a six-foot-three Black guy, has a doctorate, teaches, writes and still likes to play basketball. It also amazes me that many are still waiting for President Obama to slip into a stereotype, even though he’s bent over backwards to be neither a stereotype nor an anti-stereotype. Or, for that matter, the amazement of Blacks or others of color in watching a fast White guy play football or a tall one dunk a basketball. Stereotypes, like perceptions, are real, but not as real as the human capacity to defy them. Anyone who doesn’t believe that doesn’t believe in anything that Martin Luther King, Jr. stood for.